Memogenda - A system for getting things done. We want you to be satisfied with your purchase. If for any reason the Memogenda does not meet your needs or expectations, we will issue a full refund. NEW - LED Lighted Tip Pen so you can write in the dark! The Memogenda is now 40 years old and it still serves the purpose for which it was designed: to organize your time. Simple to-do lists are not as fashionable as PDA's, computer programs, or expensive day-planners. But in the most basic way, it will organize your day, remind you of the tasks you need to complete, and you will have a permanent written record of your efforts and it is inexpensive. • 96% of all executives make a To-Do List for the day. • 81% have 1 to 20 items on the list. • 83% say they generally complete the list. Memogendas are used in every profession and industry. The desire to be organized applies to everyone regardless of profession or position. 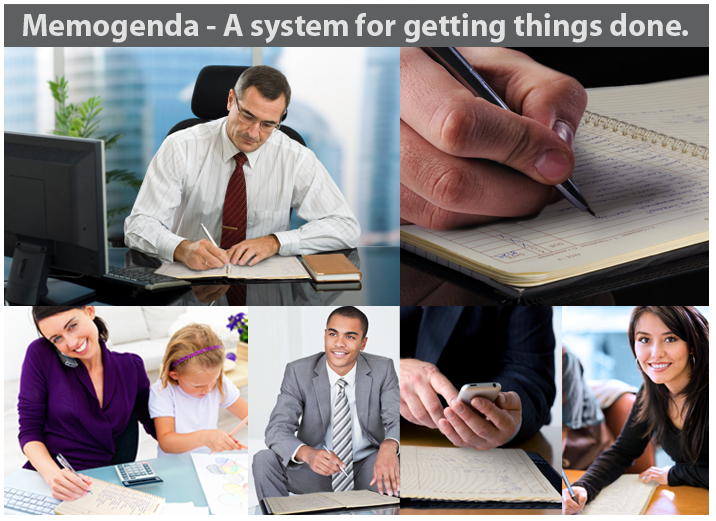 The success of the Memogenda is that it is the perfect To-Do List. I have been using the Memogenda for 27 years, and I have saved every one. My Memogendas are the diary of my career. Read the other users comments and learn how they use the Memogenda. If for any reason you are not completed satisfied with your Memogenda, we will refund your complete purchase.